In this research, a simple and fast method was employed to synthesize CuO nanoleaves/silica gel nanocomposites (CuO/SGn), which is a cost effective antimicrobial material. CuSO4.5H2O is the only raw material used in CuO/SGn production through the molten salt method. The structure and morphology of the nanocomposites were characterized by DRS, XRD, and SEM. The copper size in CuO/SG was found to be dependent on the immersion time in molten salt. SEM images revealed smaller-sized particle leaves, from a sample obtained after longer immersion time.The antimicrobial activity of CuO/SGn was investigated against Escherichia coli. The produced CuO/SGn showed inhibitory effect against E. coli. However, the growth-inhibitory effect depends on the copper content and size. Lower loading of CuO nanoparticles in 10 min immersion time resulted in less antibacterial activity (73.33%) and sample obtained from longer immersion time demonstrated higher antibacterial activity (up to 99.96%). The maximum amount of released Cu ions from nanocomposites produced in 90 min was 12.2 ppm after 6 h. Furthermore, the minimum release of Cu ions was observed by 3 h for 40 min nnanocomposite. Broad applications of metal oxide in technologically-driven countries, particularly in the field of antibacterial materials, have resulted in extensive industrial uses for metal oxide, including metal oxide in water treatment processes and in food production and storage. Metal nanoparticles such as copper, silver, and zinc are well known for their excellent antibacterial activity [1-5]. With their low toxicity, high chemical and thermal stability, high and long-lasting antibacterial activity, metal nanoparticles are suitable as bactericidal agents in applications including water disinfection . On the other hand, typical water disinfection has notable drawbacks, and post-treatment removal of nanoparticles greatly reduces the processs typical benefits. 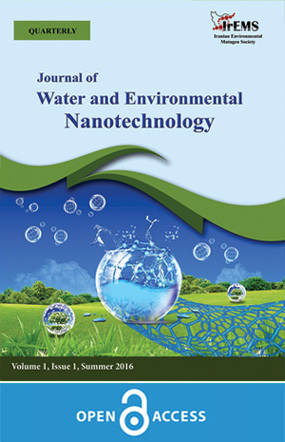 It is widely acknowledged that removing nanoparticles from water is a time consuming and expensive procedure. The solution has been to immobilize the nanoparticles on an inert support. This helps to eliminate expensive phase separation procedures. Furthermore, several reports have observed antibacterial activity of nanoparticles from immobilized nanoparticles on various supports, such as clay [2,3,5], silica gel  and metal foil . In this case, copper oxide serves as an excellent antibacterial material against bacteria, fungus, and algae because of its low price, nontoxicity, and facile preparation. Recently, different coating technologies have been developed to produce Cu/nanocomposites as antibacterial materials [7,8]. Various synthesis methods have been researched for the preparation of nanostructures, such as hydrothermal, thermal oxidation, sol­gel, wet-chemical, electrochemical deposition, sputtering, thermal evaporation, thermal relaxation, alkaline ion exchange and anodizing [3, 9-17]. Different morphological nanostructures of CuO have been reported in recent years, such as ribbon-like CuO , spindle-like 314] and 2D leaf-like [14,15]. For example, Zhu et al. synthesized one-dimensional CuO nanowires by thermal transformation of Cu(OH)2 nanowires, made from Cu7Cl4(OH)10H2O. Liang et al. successfully synthesized 2D CuO nanoleaves by microwave heating of an aqueous solution containing copper salt and sodium hydroxide. Most reported preparation methods of CuO nanostructure still exhibit several deficiencies, such as time constraints, special instrumentation requirements, complex operation, and high cost. Thus, the development of a simple, rapid, and relatively inexpensive technique to prepare CuO nanostructures is necessary and attractive. This research introduces a novel method for covering a surface in order to produce antibacterial material via the molten salt method. Synthesis of CuO/SGn through molten salt involves selecting a molten salt like CuSO4 for use as a solvent in a medium for preparing complex oxides from the salts constituent materials. For this reason, CuSO4 and silica gel were heated to the salts estimated melting point. This method can easily be expanded for large-scale commercial production. The characteristics of the produced powder are controlled by selecting the heating time. Then, the reacted mass is cooled to room temperature and washed with water to remove the salt. A complex oxide powder is obtained after drying. In contrast with other common methods, expensive equipment and chemical reagents are unnecessary. Therefore, minimum process time, high purity, and inexpensive substrates are the main advantages of our product, enabling it to be produced on an industrial scale. All reagents were of analytical grade and were used as received without further refinement. Also,all aqueous solutions were prepared with distilled water. Silica gel, CuSO4.5H2O, Mueller-Hinton agar broth, and nutrient agar were purchased from Merck Co., Inc. (Tehran, Iran). The bacterial strain used for the antibacterial activity was gram-negative Escherichia coli (PTCC 1270), received from the Iranian Research Organization for Science and Technology (Tehran, Iran). Silica gel was immersed in the melted CuSO4.5H2O at 550–560 °C for 10, 20, 40, 60, and 90 min. This operation was conducted using 5 g of silica gel and 5 g of CuSO4.5H2O. After this step, the silica gel was adequately washed with distilled water and sanitation. After dissolving, the product was dried in an oven. Synthesized samples were analyzed by X-ray diffractometer, XRD (Philips PW 1050, Germany). The patterns were registered in the 2θ range from 10º to 60º with a scanning step size of 0.05º. For this purpose, Silica gel was used as a reference. The morphology of the samples was investigated by scanning electron microscope (LEO 1430VP, Germany). Absorption spectra of nanocomposites was measured by a UV-visible diffuse reflectance spectrophotometer (Sinco Model S4100, Korea), in the wavelength range 200–700 nm. Where B is the mean number of bacteria in the control samples (CFU/sample) and C is the mean number of bacteria in the treated samples (CFU/sample) [2,3]. In order to evaluate the stability of the nanocomposites, leaching tests were performed. For each composite material, 0.2 g was immersed in 10 ml of distilled water and vigorously shaken in a shaking water bath (30 °C, 200 rpm) for 3 and 6 h. Supernatant from each test tube was collected after 3 and 6 h by centrifugation at 4000 rpm for 10 min. Copper ion release from the nanocomposites was qualitatively determined through atomic absorption spectroscopy analysis (Varian/AAS, 20BQ, USA) [2,3]. High temperature prompted the chemical reaction between CuSO4 and water, which produced an acidic solution of solid CuO and H2SO4. As mentioned before, this method is much easier than the common synthesizing approaches for CuO nanoparticles production [12-17]. Furthermore, this method generates inexpensive nanoparticles that have been one of the most important parameters, which has widespread applications. Appearance and color of the nanocomposites are shown in Fig. 1. As shown in this figure, the parent silica gel color was white. After nanocomposite production, the color of composites changed to greenish. Fig. 1 shows that increasing immersion time in molten salt enhances nanocomposites color change. The color changes are a result of the amount of copper oxide loaded onto the silica gel or the aggregation of nanoparticles on the surface of the silica gel . Other studies reported that nanoparticles coated with Ag, Zn, and Cu on bentonite (white) or silica gel (no color) change substrate color [2,4]; for example, coating nanoparticles of ZnO and Ag on bentonite and silica gel changes the parents color to cream  and yellow-brown , respectively. Therefore, color change is a sign for loading of nanoparticles on silica gel. Fig. 2 shows that silica gel has a maximum absorption peak around 304 nm and pure CuSO4.5H2O has two maximum absorption peaks around 243 and 304 nm. After composite formation, the absorption band of pure CuSO4.5H2O gradually red shifts from 304 nm to a wavelength of 314 to 320 nm, and the absorption band at 243 nm has disappeared. These changes indicate that copper oxide nanoparticles have formed on the silica gel surface. On the other hand, longer immersion of silica gel in the molten copper sulfate results in the broadening of the peak between 314–320 nm. According to the previous findings, the broadening absorption peak of a nanoparticle corresponds to the wider dispersion of synthesic nanoparticles sizes [18, 4]. Therefore, it can be concluded that the increased immersion time resulted in the formation of nanoparticles of various sizes. To better characterize CuO/SGn, its morphology was observed by SEM at different immersion times. Fig. 3 shows SEM images of the CuO/SGn. No leaf-like CuO particles were deposited on the silica surface from samples with a process time of less than 40 min. By increasing immersion time to 40 min, leaf-like shapes appeared (Fig. 3b), and the amount of nanoleaves increases with higher annealing time (Figs. 3c and 3d). The silica surface was relatively covered with CuO leaves at 90 min immersion time (Fig. 3d). Interestingly, the produced particles show leaf-like morphology of similar size on the silica surface. Fig. 3 also shows that the samples obtained from longer immersion time have smaller-sized particle leaves. The diffraction peaks at approximately 35.5° and 38.7° were indexed to the monoclinic structure of the CuO phase (Fig. 4). Thus, CuO formed on the silica surface, as expected from other studies [12, 15]. The XRD pattern of CuO/SGn shows very weak diffraction peaks corresponding to the crystallites of the copper species, which may result from the high dispersion of copper species on the substrates surface. Table 1 shows the amount of copper released into the aqueous media is a function of the contact time between phases. CuO/SGn prepared with immersion time of 90 min releases a maximum amount of copper after 6 h contact with water. It should be mentioned that the condition of this test is very violent compared with the laminar flow of water in water handling operations. The obtained results indicate that these materials pose no risk to drinking water treatment since the leached metals are quite limited and in acceptable concentrations. The antibacterial properties of CuO/SGn were studied against gram-negative E. coli. The effect of synthesis time on the antibacterial properties of the CuO/SGn is presented in Table 2. Parent silica gel showed no antibacterial activity. On the other hand, all fabricated composites containing CuO nanoparticles displayed antibacterial properties against E. coli with high mortality. The total numbers of bacteria for samples were approximately 7.5 × 1014 CFU/ml at zero contact time. These amounts declined considerably (more than 99% for E. coli) for doped silica-treated samples with CuO nanoparticles, but increased for control samples (undoped silica). As can be seen from Table 2, bacterial growth was increasingly inhibited with enhanced immersion time of the CuO/SGn samples in molten salt. Researchers acknowledge that the antibacterial activity of metallic nanoparticles is strongly correlated with their sizes and loading [2,3,7]. The CuO/SGn with 10 min immersion time showed less antibacterial activity. This may result from lower loading of CuO nanoparticles. The samples prepared with longer immersion time revealed more strongly inhibited bacterial growth (Table 2). The cell walls of viable bacteria usually are negatively charged due to functional groups such as carboxylates present in lipoproteins at the surface. CuO/SG attracts bacteria by electrostatic forces and immobilizes them on the surface. CuO may also disassociate and directly exert its antimicrobial effect on the bacteria in the dispersion . As mentioned previously, increasing synthesizing time enhances antibacterial properties. The SEM images demonstrate that longer process time results in loading more nanoparticles. On the other hand, release test for the sample produced in 90 min shows greater antibacterial activity. These results support each other and concur with others findings (2-4). In this research, CuO/SG was successfully synthesized by a fast and simple method. The results demonstrated that immersion time affected nanoparticle size, and longer immersion time produced various sizes of CuO nanoparticles. SEM images revealed smaller-sized particle leaves, from a sample obtained after longer immersion time. The maximum amount of released CuO was found after 6 h contact with water, with no risk to drinking water. All produced composites containing CuO nanoparticles displayed antibacterial properties against E. coli with high mortality. Lower loading of CuO nanoparticles in 10 min immersion time resulted in less antibacterial activity and sample obtained from longer immersion time demonstrated higher antibacterial activity. 1. Appendini P, Hotchkiss JH. Review of antimicrobial food packaging. Innovative Food Science & Emerging Technologies. 2002;3(2):113-26. 2. Pouraboulghasem H, Ghorbanpour M, Shayegh R, Lotfiman S. Synthesis, characterization and antimicrobial activity of alkaline ion-exchanged ZnO/bentonite nanocomposites. Journal of Central South University. 2016;23(4):787-92. 3. Pourabolghasem H, Ghorbanpour M, Shayegh R. Antibacterial Activity of Copper-doped Montmorillonite Nanocomposites Prepared by Alkaline Ion Exchange Method. Journal of Physical Science. 2016;27(2):1-12. 5. Gilani S, Ghorbanpour M, Parchehbaf Jadid A. Antibacterial activity of ZnO films prepared by anodizing. Journal of Nanostructure in Chemistry. 2016;6(2):183-9. 6. Ghorbanpour M, Lotfiman S. Solid-state immobilisation of titanium dioxide nanoparticles onto nanoclay. Micro & Nano Letters [Internet]. 2016; 11(11):[684-7 pp.]. Available from: http://digital-library.theiet.org/content/journals/10.1049/mnl.2016.0259. 7. Top A, Ülkü S. Silver, zinc, and copper exchange in a Na-clinoptilolite and resulting effect on antibacterial activity. Applied Clay Science. 2004;27(1–2):13-9. 8. Stanić V, Dimitrijević S, Antić-Stanković J, Mitrić M, Jokić B, Plećaš IB, et al. Synthesis, characterization and antimicrobial activity of copper and zinc-doped hydroxyapatite nanopowders. Applied Surface Science. 2010;256(20):6083-9. 9. Ghorbanpour M. Amine Accessibility and Chemical Stability of Silver SPR Chips Silanised with APTES via Vapour Phase Deposition Method. Journal of Physical Science. 2016;27(1):39-51. 10. Zhen-Hua L, Ying-Jie Z. Microwave-assisted Synthesis of Single-crystalline CuO Nanoleaves. Chemistry Letters. 2004;33(10):1314-5. 11. Ghorbanpour M. Fabrication of a New Amine Functionalised Bi-layered Gold/Silver SPR Sensor Chip. Journal of Physical Science. 2015;26(2):1-10. 12. Ke F-S, Huang L, Wei G-Z, Xue L-J, Li J-T, Zhang B, et al. One-step fabrication of CuO nanoribbons array electrode and its excellent lithium storage performance. Electrochimica Acta. 2009;54(24):5825-9. 13. Zhang X, Wang G, Liu X, Wu J, Li M, Gu J, et al. Different CuO Nanostructures: Synthesis, Characterization, and Applications for Glucose Sensors. The Journal of Physical Chemistry C. 2008;112(43):16845-9. 14. Yan Z, Jingzhe Z, Yunling L, Dechong M, Shengnan H, Linzhi L, et al. Room temperature synthesis of 2D CuO nanoleaves in aqueous solution. Nanotechnology. 2011;22(11):115604-11. 15. Huang C-C, Hwu JR, Su W-C, Shieh D-B, Tzeng Y, Yeh C-S. Surfactant-Assisted Hollowing of Cu Nanoparticles Involving Halide-Induced Corrosion–Oxidation Processes. Chemistry – A European Journal. 2006;12(14):3805-10. 16. Zhu L, Chen Y, Zheng Y, Li N, Zhao J, Sun Y. Ultrasound assisted template-free synthesis of Cu(OH)2 and hierarchical CuO nanowires from Cu7Cl4(OH)10·H2O. Materials Letters. 2010;64(8):976-9. 17. Ghorbanpour M, Falamaki C. A novel method for the production of highly adherent Au layers on glass substrates used in surface plasmon resonance analysis: substitution of Cr or Ti intermediate layers with Ag layer followed by an optimal annealing treatment. Journal of Nanostructure in Chemistry. 2013;3(1):66. 18. Zhou Y, Xia M, Ye Y, Hu C. Antimicrobial ability of Cu2+-montmorillonite. Applied Clay Science. 2004;27(3–4):215-8.